With the release of Mac OS X Lion Apple has updated the Mac mini compact desktop computer. 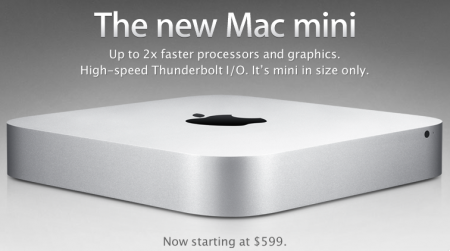 The new Mac mini models removed the optical drive and added Thunderbolt support (up to 10Gbps transfer speeds). The Mac mini was also updated with Intel Core i5/Core i7 Dual Core processors, AMD Radeon HD 6630M video card, Bluetooth 4.0 and other improvements. Mac mini Server was also updated to include a quad core processor. Prices start from $599 for Mac mini and $999 for Mac mini Server and they’re available on Apple’s website. CUPERTINO, Californiaâ€”July 20, 2011â€”AppleÂ® today updated the MacÂ® mini with next generation Intel Core processors, new discrete graphics, high-speed Thunderbolt I/O technology and Lion, the worldâ€™s most advanced operating system. The new Mac mini delivers up to twice the processor and graphics performance of the previous generation in the same amazingly compact and efficient aluminum design. * Starting at just $599 (US), the new Mac mini is available for order today and in stores tomorrow. At just 7.7-inches square and 1.4-inches thin, the new Mac mini maintains its compact aluminum design while delivering amazing performance and graphics capabilities. Available in three different configurations, customers can choose a Mac mini with the latest dual-core Intel Core i5 or Intel Core i7 processors, AMD Radeon HD 6630M discrete graphics, or a quad-core Intel Core i7 powered server configuration. Designed without an optical disc drive, Mac mini can access the optical drives on other PCs and Macs, and works with the MacBook AirÂ® SuperDriveÂ®. Configure-to-order options include up to 8 GBs of memory, a faster 7200 RPM hard drive and a 256GB solid state drive. Mac mini now comes with Thunderbolt I/O technology for expansion possibilities never before available to Mac mini users. With a Thunderbolt port, Mac mini can connect to peripherals such as high-performance storage devices, RAID arrays and the new Apple Thunderbolt Display, a stunning 27-inch IPS widescreen display thatâ€™s great for making FaceTimeÂ® HD video calls, surfing the Web and viewing movies and photos. With ultra-fast Wi-Fi, you can wirelessly download apps from the Mac App Storeâ„¢, get music and movies from iTunesÂ®, back up data to Time CapsuleÂ® and share files with AirDrop, which makes transferring files quick and easy. Mac mini includes Bluetooth for wireless peripherals and four USB ports for easy connectivity for the wired and wireless devices you use every day. The new Mac mini remains the worldâ€™s most energy efficient desktop, meets Energy Star 5.2 requirements and achieves EPEAT Gold status. ** Mac mini has a highly recyclable aluminum enclosure, PVC-free components and cables, no brominated flame retardants and features material-efficient system and packaging designs. Every new Mac mini comes with Mac OSÂ® X Lion, the latest major release of Mac OS X, the worldâ€™s most advanced operating system, and iLifeÂ® apps for creating and sharing great photos, movies and music. Lion introduces more than 250 new features to the Mac, including Multi-TouchÂ® gestures and system-wide support for full screen apps; Mission Control, an innovative view of everything running on your Mac; the Mac App Store, the best place to find and explore great software; Launchpad, a new home for all your apps; and a completely redesigned Mail app. The new Mac mini is available through the Apple StoreÂ® (www.apple.com) today and in Appleâ€™s retail stores and Apple Authorized Resellers starting July 21. **EPEAT is an independent organization that helps customers compare the environmental performance of notebooks and desktops. For more information visit www.epeat.net. Tentative ETA here in KSA Khaled?